We’re not just talking a big game; we’re offering the first open-center mid-rise lift ever made. 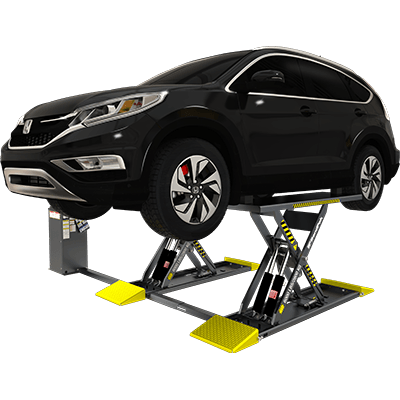 Decades of experience have taught us a thing or two about vehicle lift points. A car ​lift with longer platforms means you get to lift more vehicle types than ever, correctly. The “correct” part is key. Too many well-meaning shops risk personal safety and the well-being of the vehicles they work on because their lifts don’t reach OEM jack points. The redesigned MDS-6LP corrects that problem once and for all with longer platforms. This means an extended lifting point spread. Converting your low-rise pad lift to a flush-mount design is now easier than ever. The ramps attach directly to the platform. This makes it easy to work on elevated vehicles, especially in the wheel well area. The approach ramps have slotted receivers and simply drop into place. They can be easily removed by lifting upward. The MDS-6LP mid-rise lift has a pivoting “kicker” mechanism that helps with low ground-clearance vehicles. Scissor lifts in general have poor mechanical advantage when fully lowered. They have no lifting force until the frame rises a few inches. This kicker is like having booster rockets for the first 152 mm of upward movement. Your ​mid-rise pad lift is no wimp. Four super-powerful hydraulic cylinders with a proprietary flow divider ensure the separate platforms remain level and efficient at all times. It takes mere seconds to get to the max rise. This lift also features the best electric-hydraulic technology the industry has to offer. As the platforms rise, locks automatically engage at several heights. This safety feature ensures two things: more versatile positions to work from and increased safety as the platforms rise. For your safety, hydraulics are not engaged when the safety arms rest on the mechanical locks. Once the lift moves, hydraulic pressure resumes. Air cylinders replace spring releases on the MDS-6LP mid-rise lift. They make sure the locks release at the same time as the lift descends. Each cylinder need to be pressurized with a 50 PSI, 10-CFM air source at the time of installation. Any air compressor or hand pump will do the trick. Releasing the mechanical lock system is as easy as pressing a button. The locks deactivate instantly and the lift lowers completely in seconds flat. You’ve never seen a more convenient or easy-to-use lock release system. Zerk grease fittings are self-lubricating and long-lasting. They require minimal maintenance to ensure your car lift lasts for years without trouble. Spend your days working without the squeal of metal-on-metal. The MDS-6LP mid-rise pad lift practically maintains itself with these rugged fittings doing the work for you. BendPak rubber blocks are tough, hard and super-durable. Other companies offer little pads and small blocks that shred after heavy use. Not ours. They’ll last for years without issues. If you ever need replacements or want to order an extra set, give us a call! We’ll help get them shipped right to your door. The MDS-6LP and MDS-6LPF reach a comfortable 1,130 mm of rise with the lift blocks in place. More lock positions in a mid-rise pad lift makes it easier to manage your work. If you just need to get the wheels a few inches off the ground, use one of the lower settings. If you want to scoot under more comfortably, raise the lift to the top lock position. With BendPak, the choice is yours! Safety decals, the owner’s manual, lift point spread information and a safety placard for training purposes are all included for your convenience. Learn everything you can about your car lift, and teach others everything you know. They’ll be sure to pay it forward, maintain best safety practices and help keep your mid-rise lift working for years to come. If you’re looking to flush-mount your ​lift in the floor for a smooth sub-surface installation, be sure to choose the MDS‐6LPF flush-mount mid-rise lift. It features all the same features of the MDS-6LP but is more ideal if you want your lift to collapse perfectly parallel with your flooring.